I don't have much to add to what's already been said about Ryan Braun's new contract. I think it is an absolutely fabulous deal for the Brewers. Considering that they signed Jeff Suppan two years ago to 4 years at $42M, signing Braun for 7 years and only $5M more is incredible. As expected, the signing of Braun has refueled the talk of signing other players on the team, and Prince Fielder's name is at the head of the list. I'm not going to go off again on Fielder's eating habits, but his lack of production at the plate this year has me seriously concerned. It's not just the home runs. On a per plate appearance basis, he is striking out less, grounding out more, hitting more singles, and hitting fewer extra base hits than he did last year. To me those are all signs of a reduction in power. 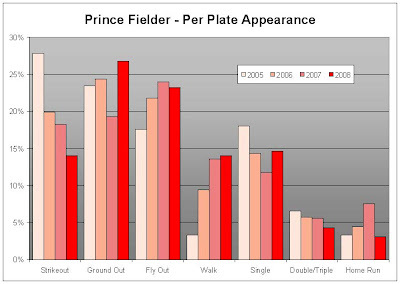 As a result, through 40 games this season, Prince Fielder has been a less than average Major League first baseman. He's becoming more like Lyle Overbay and less like Babe Ruth. Matt LaPorta is tearing up minor league pitching and knocking at the doorstep of the Majors. It's plausible the he would be as good as the 2008 Prince Fielder right now. Until the Brewers figure out why Fielder isn't hitting like he was last year (and they could ask me), it would be a huge mistake to sign him to a deal anywhere near the size of Braun's. As a matter of giving credit where it is due, I got the idea for the batting spectrum chart above from a comment by reader David J. Flemming at Bill James Online. I've just recently started playing around with them, but they give an interesting profile of a hitter's performance. You may be seeing more of these here.